St. Mary’s Basilica in the Main Square is one of Krakow’s best landmarks and probably one of the most widely recognised churches in Poland. 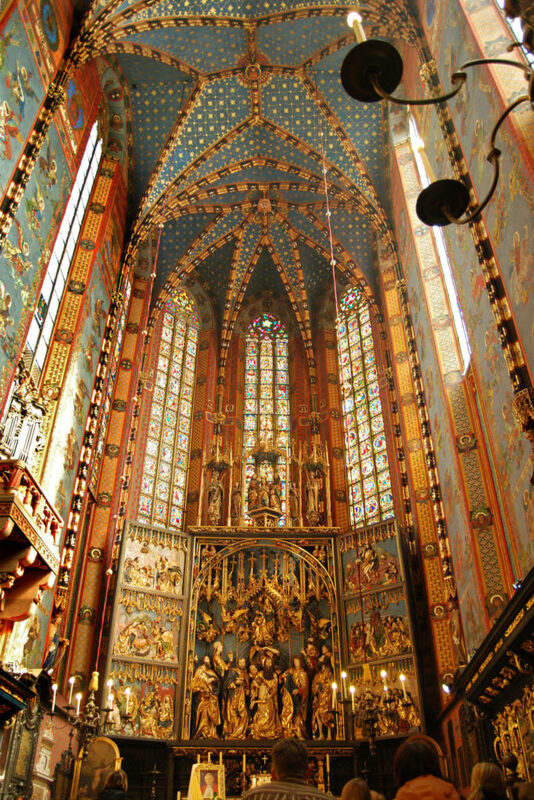 It is an excellent example of Gothic architecture in Poland and its interior hides the world-class wooden altarpiece carved by Veit Stoss. From the taller of its two towers, a trumpet signal is played every hour, which one of best-known symbols of Krakow. St. Mary’s Basilica was erected in the early 13th century. First, a Romanesque church, it was rebuilt in early-Gothic style around 1290 and consecrated as St. Mary’s Church thirty years later. With the reign of king Casimir III the Great, the church underwent major changes. Between 1355 and 1365, the church was rebuilt into a magnificent Gothic edifice. The presbytery was elongated, with a contribution of a wealthy burgher, Mikolaj Wierzynek. Also, tall stained glass windows were added, so characteristic to Gothic architecture. The main body was completed in the 1390s with the new vault constructed by master Nicholas Werhner from Prague. The vault over the presbytery collapsed in 1442 due to a possible earthquake, first ever in the history of Krakow. The new vault, preserved until today, was constructed by master Czipser, a resident of Kazimierz. In the first half of the 15th century, the side chapels were added. Most of them were the work of master Franciszek Wiechon. At the same time, the northern tower was raised in order to serve as the watchtower for the city. In 1478 the late-Gothic helmet was installed. In 1666, a gilded crown was placed on it and is still present today. The interior is almost entirely Gothic in style. The main nave is 28 meters height and covered with a cross-ribbed vault. The interior is illuminated by large, stained glass windows. Only three of the original, Gothic stained glass remained preserved until today. Stained glass windows in the presbytery are the works of Jozef Mehoffer and Stanislaw Wyspianski from the late 19th century. In that time, the church underwent series of renovations, for example of the polychrome in the main nave that was revamped by Jan Matejko and aforementioned Mehoffer and Wyspianski. At the end of the 15th century, St. Mary’s church was enriched with a sculptural masterpiece of late Gothic, an altarpiece by Veit Stoss. It is a pentaptych measuring 13 m height and 11 m wide when all panels are opened. The panels can be opened separately to create a triptych or can remain closed. There are over 200 figures sculptured and the largest of them measure about 2.8 m. The main scene, the death of Mary in the presence of the Twelve Apostles is depicted in the centre of the altarpiece. Other panels are dedicated to scenes of the life of Mary, such as Annunciation, Nativity scene, Resurrection of Christ, Assumption of Mary. By the altar, there are stalls for city’s councilors, aldermen and powerful families from the 17th century. An enormous crucifix that divides the presbytery and the altar is a work of Veit Stoss’ students. Veit Stoss is also associated with a stone crucifix that is located in the now late-Baroque altar in the right nave. The three naves of the basilica are surrounded by the ring of chapels. Built in the middle of the 15th century were founded mostly by wealthy burgher families, and are now mostly Baroque in style. 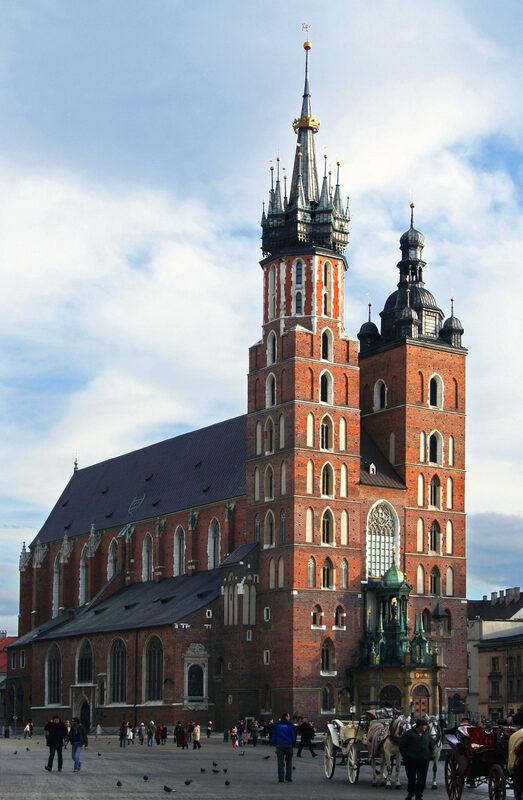 St. Mary’s Basilica is famous for the daily Trumpet Call (hejnal in Polish). Each day, thousands of people gather in the Main Square to listen to the most characteristic melody in Krakow. At first, it was only played at noon, but now the trumpet call is played every hour. It is played four times in succession in each of the four cardinal directions. The taller tower of the St. Mary’s Basilica had served as an observation point of the city from as early as 1392. Guards gave the signal for opening and closing of the city gates. It was also a sign of imminent danger (for example, fire or invasion of the enemy), and of welcome of the distinguished guests entering the city. The real origin and author of the call are unknown. The Polish word hejnal comes from hajnal, the Hungarian word for “dawn”. 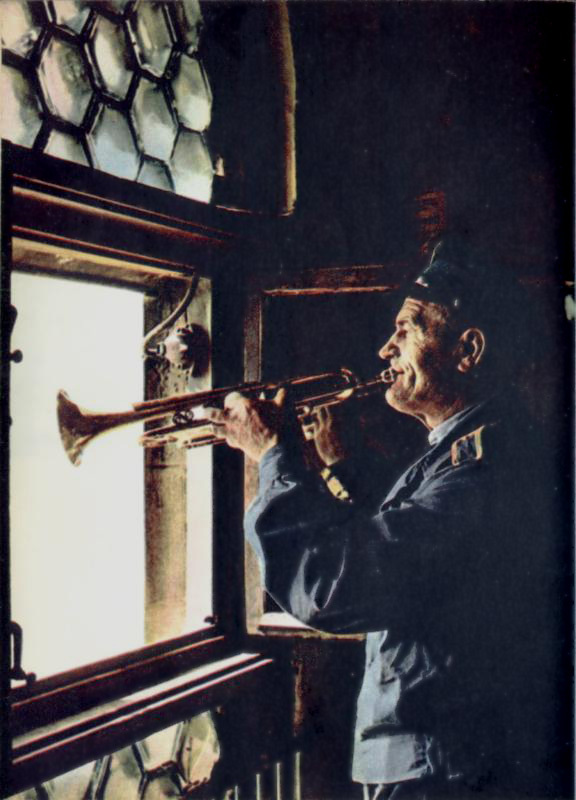 Trumpet calls were used in many European cities to signal the opening and closing of city gates at dawn and dusk. Poland had also close relationship with Hungary and two rulers from the Hungarian dynasty, King Louis I (in Poland 1370–82) and his daughter Jadwiga, Queen of Poland (1384–99). This might be the likely explanation for the Polish term, hejnal. The trumpet call always breaks as though unfinished. It is a historical symbol of the city. It is said in one of the most popular legends of Krakow that during a Mongol invasion the guard started an alarm, and although he warned the people and the gates were closed in time, he was killed, hit by an arrow of approaching invaders and did not finish to play the trumpet call. Although it seems unlikely that the arrow would reach the trumpeter on the tower of St. Mary’s Basilica, the trumpet call is always played unfinished to commemorate the event in the legend. The tower is also accessible for visitors who want to admire an incredible vista of Krakow. Tourists are allowed to visit only the front part of the Basilica (presbytery and the altar). The rear part is reserved for prayers. Monday – Saturday 11.30 a.m. – 6 p.m.
* In May and June, last admission 5.30 p.m.; Last Thursday of the month, last admission 4.30 p.m.
** Daily at 11.50 a.m. – celebratory opening of the Veit Stoss altarpiece. * Ticket office closes 15 minutes before above closing time. Break: 11:30 a.m. – 13:10 p.m. 11:30 a.m. – 13.10 p.m.
* Entry in groups of 10 people every 30 min. ** Children under the age of 7 are not allowed to enter the tower due to safety reasons. *** In case of bad weather, the tower can be closed for visitors!